1.It makes it easy for Producers to see that you have some real industry experience. Producers are looking to hire specialists who know their job, even when the job is Production Assistant. Highlighting your department head work in multiple departments on student shorts, mixed in with support work in the same departments on indy features or TV shows, wastes their time and yours. It doesn’t matter that you have worked in all these different departments. 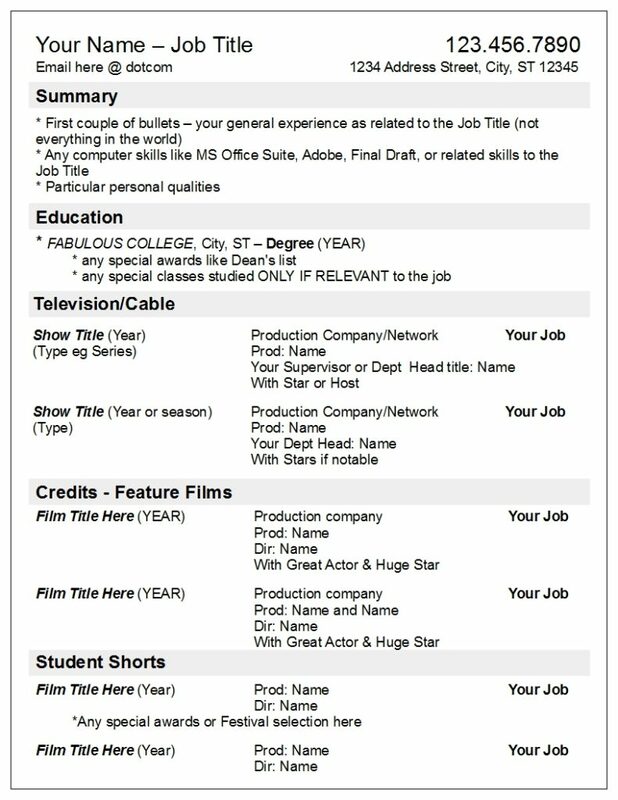 Student short experience does not qualify you for the department head job on a multi-million-dollar feature film. It will barely qualify you for PA work. Producers don’t mind teaching and training college interns or union trainees. It’s part of the deal. Lots of department heads like to mold their protégés in their own particular methods. But most of the time, hirers don’t want to have train-from-scratch the people they hire to do a job. They want to know that you at least know your way around a movie set, or a TV sound stage, or the production office. Mixing all your student work into your professional work, so that the hirer has to work to sort it out, is annoying. 2. It makes it easy for Producers to see where your experience has been. There are “walls” between different areas of the business. By this I mean most of the time people work in one arena/media predominantly, partly reflecting the different workflows and tech in different fields. The walls aren’t impossible to get past, but the different arenas tend to have separate networks. People who work primarily in film, know and network with each other, people who work primarily in TV know each other, and so on. Hirers are interested in seeing if you worked with someone they might know. 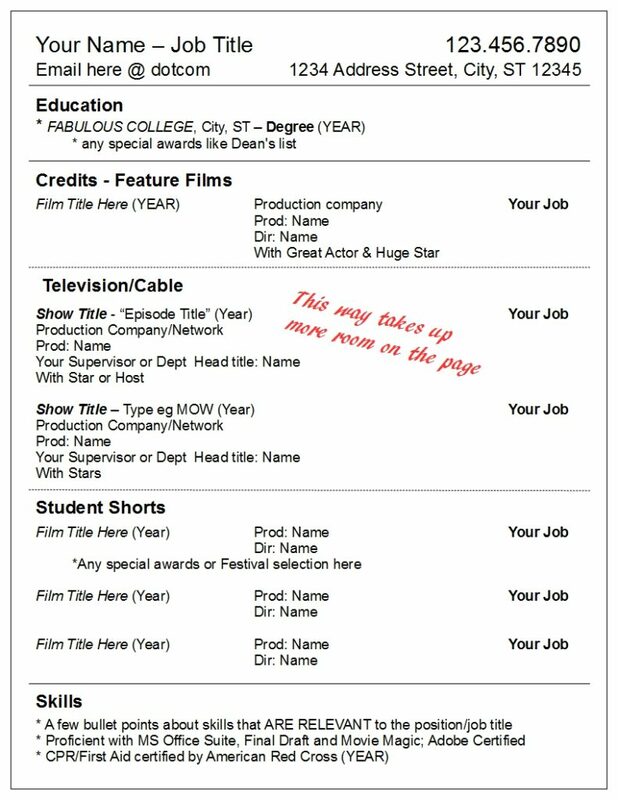 You want the Producer to see at a glance that you have been working in features, or tv series, or documentaries, or commercials – whatever the arena is – that is most relevant to current job application. That is how they get an idea of the kind of work practices to which you have been exposed. They understand at once what kind of budget level at which you have been working. That is what matters. Along the same lines, dividing by media facilitates customizing for job applications, and reflects how the industry actually works for most employees. 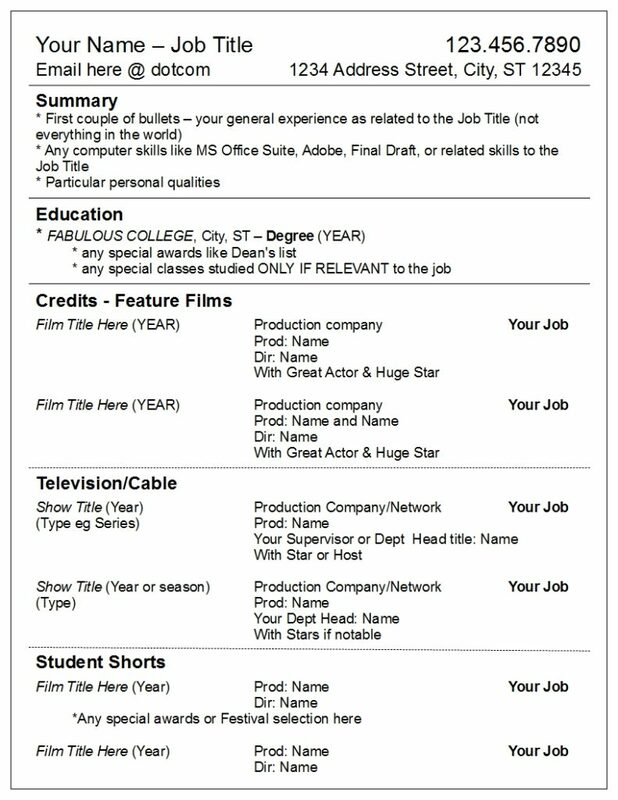 You just bring the whole TV section to the top for TV jobs, the film section to the top for film applications, and so on. 3. It is easier to drop the student stuff off your resume as you get real credits, if they are their own section. And you do want to drop them off as soon as you can, unless they have become notable in some way, such as winning a prize at a festival. …that is as compared to the public version of IMDb which divides experience up by job type. Media reflects the professional aspect of the business. Even without any of the other reasons, this is enough. 5. Commercials and Music Video should be formatted in a different style. The key information for these is the Director, the product (client, band) and the name of the spot or song. They need their own sections. I will show an example of this in an upcoming post. Do you see that these all point to ease and clarity? Make it easy for them to hire you.